"Does being waitlisted count as half an acceptance??" "Being waitlisted from your top choice is the worst feeling"
"What should one do when waitlisted at their top choice school? Asking for a friend." "All these waitlisted got me feelin like Ladybird." Those are just some of the thoughts that high school seniors have tweeted in the past few weeks. They've opened their mail — or, more likely, an online portal — to finally hear decisions from colleges. But many didn't get one. The number of students placed on college waiting lists has climbed in recent years, leaving students hoping for the best — even when they might not have any reason to hope at all. "Many students ... think they're very close to getting in, and that there's considerable hope for them to be admitted to the college," says Cristiana Quinn, a private college admissions counselor in Rhode Island. That's not the case. In the spring of 2017, Dartmouth College, a small ivy league school in New Hampshire, offered 2,021 waitlist spots to applicants. Of the 1,345 who chose to stay on the waitlist, not a single person got in. The University of Michigan offered 11,127 potential freshman a place on their waitlist that spring — 4,124 students accepted spots on the list, and 470 eventually got in. The odds aren't as slim elsewhere: At the University of Wisconsin–Eau Claire, 100 of the 450 students on the waitlist were accepted in 2017. And some schools, like North Carolina A&T State University and the University of Alabama, don't use a waitlist at all. According to 2017 numbers from the National Association of College Admission Counseling, about 40 percent of colleges use waitlists. The schools that do make applicants wait for a final decision do so to keep their options open, says Quinn, who works with students and families during the college application process. "They want to have a very large pool to choose from — so that, for instance, if they don't have a student from South Dakota, they can pull one from South Dakota. If they don't have a student who plays the oboe, they can pick an oboe player, and on and on," she says. When schools keep their admission rates low, it impacts school rankings and reputation — plus, intentional or not, the more students who almost get in are now thinking, talking and tweeting about them. Quinn recently penned an open letter to college admissions officers on a private email list of admissions professionals. "I beg you to stop the insanity," she wrote. "Stop what you are doing to kids and parents and move to a modicum of reality next year when you create your waiting lists." She says all of her students awaiting spring decisions were wait-listed at at least one school — and many of them were wait-listed at many. That hasn't happened in the past. "[Students] are not fully exploring the colleges where they have been accepted," she says. Instead, they hold out hope for the colleges where they've been wait-listed. For low-income students, who depend on aid for tuition assistance, holding out for an offer becomes unrealistic because colleges often have little if any financial aid left over by the time they turn to the waiting list. So what should students do once they've been wait-listed? Quinn encourages students she works with to write letters of continued interest to colleges — and to apply to other schools with rolling deadlines and openings. "All is not lost," she tells them. It's April, which means the college-bound students of the class of 2022 are hearing yes or no from the schools they've applied to. Increasingly, though, they're getting a maybe. That's because more and more colleges are putting students on waitlist. But one college admissions adviser says schools are overdoing it. Cristiana Quinn wrote an open letter criticizing the practice of putting large numbers of students on waitlist. I asked her why she sees that as a problem. 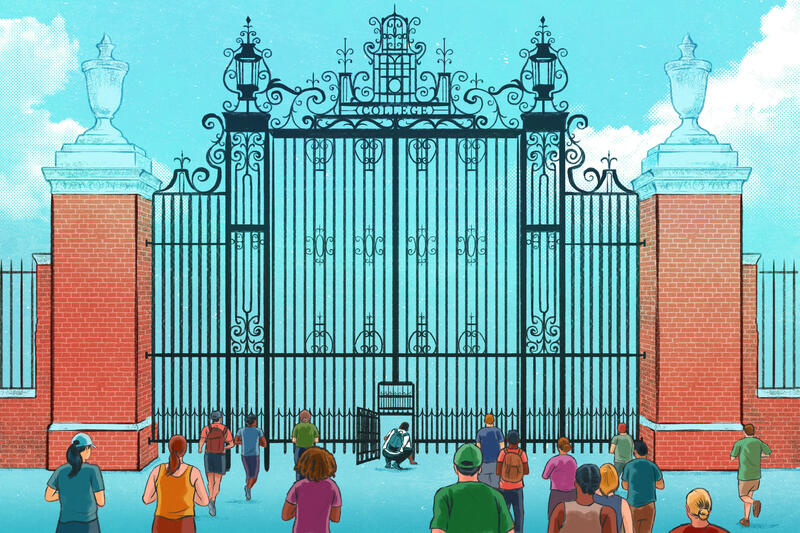 CRISTIANA QUINN: What we've seen in the college admissions counseling world is that over the last few years, the number of students that we've had waitlisted has increased, and the number of schools that they're waitlisted at has increased. So I've been doing this for about 10 years, and 10 years ago, it might be common for me to have three or four students on one, two, possibly three waiting lists. This year, all of my students who made regular admissions were waitlisted. And I've been getting a lot of calls on my phone lately from families where their students haven't been accepted anywhere. They're on five, six, eight waiting lists. CORNISH: Talk about the colleges that you think are deploying this tactic. And what is the motivation from a college admissions perspective? QUINN: So for instance, if we look at numbers from last year because this year's numbers haven't published yet, Boston College last year waitlisted 5,689 students and took 112. U Michigan waitlisted over 11,000 students and took 36. Williams College waitlisted over 2,300 students and took 24. So we're looking at that from a perspective of larger private universities, public universities and small liberal arts colleges are really all doing this. CORNISH: So you say they're overdoing it, but why shouldn't a college keep their options open, right? Students are doing the same. QUINN: Well, if you look at it from a student perspective, many students when they get waitlisted think they're very close to getting in. And the reality is that many of these schools, they're accepting 1 percent, 2 percent, 3 percent off of the waiting list. CORNISH: Does it make the school look better? Is it - like, what is the motivation there? QUINN: There are several motivations. Traditionally, colleges have put students on the waiting list who were maybe somewhat qualified and perhaps their parents were legacy. Or they had a VIP donor helping them in the admissions process, and they didn't want to ruffle feathers. Or perhaps the college wanted to keep a good relationship with that high school. But now what we're hearing from colleges is that they want to have a very large pool to choose from so that, for instance, if they don't have a student from South Dakota, they can pull one from South Dakota. If they don't have a student who plays the oboe, they can pick an oboe player. But that really has students holding out hope because a lot of students don't see these numbers that are published in the common data set on waiting lists. CORNISH: Can you talk about the financial implications of that? QUINN: Unfortunately you will find that at many colleges, there is very little if any financial aid left by the time the colleges go to the waiting list. And that can be even at need-blind colleges and some of the wealthiest colleges in the country. CORNISH: In the meantime, what are you telling your families, especially those maybe who find themselves on only waitlist? QUINN: So for families where the student is only on waiting lists, there are colleges that have openings and have rolling admissions into the summertime. So there's still a chance to apply to colleges. CORNISH: But do you tell them, look; this waitlist is a sham; you're not getting in any of these schools; we've got to come up with a new plan. QUINN: No. I do have students write a letter of continued interest to the colleges where they're on the waiting list, and then I have them pursue colleges where they have rolling admissions or where there still may be openings. CORNISH: That's Cristiana Quinn. She's a college admissions adviser in Rhode Island. Thank you for speaking with us. QUINN: Thank you for having me. Transcript provided by NPR, Copyright NPR.